This is a piece of art. It records the voyage of a block of stone. I was bored, and was looking for a museum to visit. The exhibitions at the Hague were dull; I’ve been to Rotterdam, Zwolle and Groningen in the last month to see their exhibitions. It struck me that I might visit the van Abbe museum of modern art in Eindhoven. One of my less visited galleries because it focusses on modern art. The kind of thing that either bores or baffles. Baffles, that is, if you have no concept of the subconscious. Since I and a few friends do, such exhibitions are just more boredom. I know that there are many who get excited by modern art: it is conceptually new, breaks new ground by painting in ways that have never been painted before. Doing things that have never been done before. Which is why Rossella Biscotti ‘Il Viaggio’ – The Voyage – had me in fits of giggles. Because you can’t see it. Perfect for all those who want to imagine anything they choose! That’s for another post about modern art and my visit to Zwolle. The other exhibition, not the one about the traumatized. You see, Rosella Biscotti won the prestigious ‘Michaelangelo Prize’ in 2010, and the prize she won was a coveted block of the purest white Carrera marble from the very same quarry that Michaelangelo had his marble dug out of. Her concept of her art was daring as it was daft: she took this beautiful and irreplaceable piece of stone out to sea in a ship and tipped it over the side. This really is the kind of art where you have to ask the artist what they were thinking. After all, it doesn’t take much artistic effort to push something overboard. Okay, so the idea itself was original and probably had her wetting her knickers in gleeful imagination at the applause from the artistic community. They were happy enough to give her a prize for doing it, the 2016 Quadrenniale di Roma. I mean, even the abstract and practically meaningless curves of a Barbara Hepworth have more to say. 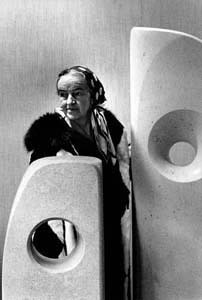 Hepworth’s ideas weren’t daring, but they weren’t exactly artistic either. They were just there: each a block of wood or stone carved into a curved form with that all important hole in the middle for everybody to peek through. Humans are fascinated by holes; inspired, even. Animals just sniff them and shake their heads. Nope: the seabed it would be, so seabed it was. Because nobody can see it! There’s only the report of its happening plus half a dozen videos taken on the iPhones of the grinning spectators. The crew would have been as baffled as any who weren’t in on the joke. She took something that could have been as beautiful to behold as Michaelangelo’s David. Instead, she leaves it untouched and drops it in the sea like the pennies thrown in the Trevi fountain. Only you can see the pennies – you can’t see this stone. It’s invisible. Nobody passing that spot is going to know it’s there. To the casual onlooker out for the day in their motorboat, this artwork looks like any other bit of sea on the planet: it would look just as it did when the Emperor Vespasian sat on the throne. In all of my posts about modern art, I have always asked the question about what it is the artist is trying to say. Biscotti’s work was intended as a metaphor for the political and commercial problems that the world faces due to international logistics operations. Or something of that sort. After all, she did use those systems in her prank. The problem is a little more serious than she imagines, or is aware of. As mentioned in my last post, ‘Live Wires,’ getting through to these kinds of people will take a little more than dropping a pebble down a well. Or a block of stone in the sea. It’s not a matter of scale, it’s a matter of impact that matters here. The kind of thing that will actually get penetrate the barriers surrounding the comfort zone of the dull witted will need to be so powerful that it will dismember their minds. The only sensible thing you can do is to leave them to twiddle their fingers in boredom whilst you get on with creating something worthwhile. Modern art is all about the mind, not reality. Art is about reality and what happens in the mind of the observer that is inspired by the things the artist portrayed. This isn’t to say that a person in our day and age cannot be an artist: Tom Thomson proved that. It’s just that most of ’em are away with the fairies. I want to turn to look at this supposed artwork from the viewpoint of the subconscious. A surface, like the surface of the sea is a very real metaphor for the things that go on below our diaphragm. Another surface beneath which we have little by way of consciousness. The only time we do is when it goes wrong: when we’re hungry. That’s the problems with systems, by the way. You’ll only notice them when they go wrong, and in the case of a system, that usually means it’s too late. Systems, like art, need to be beheld in consciousness, not the imagination. Which leads me to wonder if this entire idea wasn’t inspired by the Mafia. This block of marble has to be worth a cool million, doesn’t it? They know where the marble is, and can retrieve it without much effort. Thus the prize money from the government is transferred via the artist to their own coffers and nobody’s the wiser. It’s the way German taxpayer’s money pays for the EU support of the Greek banks… whose debt payments go to Wall Street. Previous Post Boys Don’t Have Bad Hair Days. Personally, I’d say- no, it’s not Art. Let those who say otherwise come up and enlighten us. Otherwise, your last thought may just as well be the most probable review of this piece of stone age ieroglyphs . And what kind of argument would such people use in order to enlighten us? I have an upcoming post that deals with the kind of thing people say when faced with the work of an artist that is barely comprehensible.